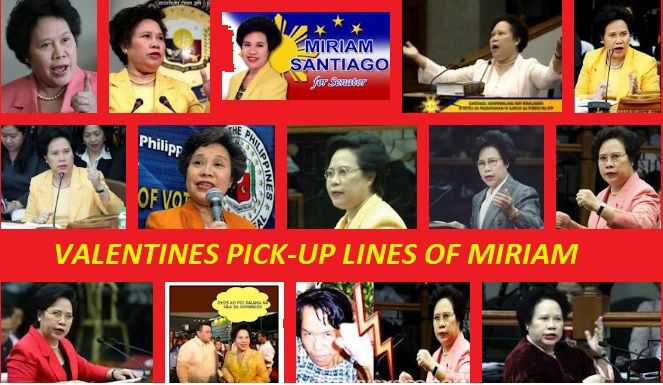 Senator Miriam Defensor Santiago has just delivered her pick up lines for Valentines Day (february 14, 2012). And her valentines pick up lines for lovers effective enough for those lovers out there - young and old, reflecting how lovely of those Sen Miriam Santiago's Pick up lines delivered by her according to the news. May in tagalog or english valentine pick up lines from Sen Miriam Santiago but these were real pick up lines for this incoming Valentines Day. You can share this Valentines Pick Up Lines of Sen Miriam Santiago by linking this url page on facebook wall, email, text messages, or in any ways you have to your dearest friends, family and relatives, strangers, and especially through your special someone this coming Valentines Day - "which lovers express their love for each other by presenting flowers, offering confectionery, and sending greeting cards" according to wikipedia. Girl: Saan tayo magde-date sa Valentine's? Boy: Para mapatunayan kong patay na patay ako sa'yo. Pedicab ka ba? Pedicabang i-date sa Valentine's Day? Bulaklak ka ba? Paa mo kasi maugat. Ang sabi nila, 'An apple a day keeps the doctor away.' Kung guwapo o maganda ang doctor, ayoko na ng apple. Pwede bang magpa-blood test? Para malaman mo na type kita. Malapit na ang Valentine's Day ah. Pero bakit ikaw mukha ka pa ring Halloween? Empleyado ka ba? Empleyado rin ako. Pwede tayong magkaroon ng union." "Bulaklak ka ba? Paa mo kasi maugat." "Malapit na ang Valentine's Day, pero bakit ikaw mukha pa ring Halloween?" As what Sen Miriam Santiago have said "When you are still undergraduate, full of enthusiasm for the future, full of energy and patience to change the world, you're trying all the time to pick a date on Valentine's Day, you can use the following pick-up lines.."
More and more pick up lines by Sen Miriam Santiago for all of us not only this coming Valentines Day but also for some occasions. More power to Sen Miram and her Valentine Pick Up Lines...! See you next time here on our PICK-UP LINES page. ARE YOU NOW READY FOR THIS VALENTINES SEASON? HAVE A HAPPY VALENTINES TO YOUR SPECIAL SOMEONE!